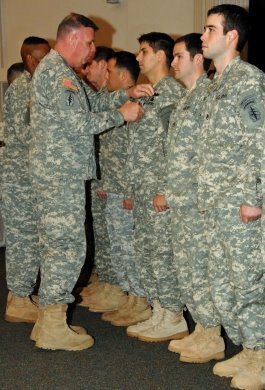 At the John F. Kennedy Auditorium, Fort Bragg, N.C., Dec. 12, Lt. Gen. John F. Mullholland awards Silver Star Medal to Sgt. 1st Class Luis Morales of 3rd Battalion, 3rd Special Forces Group (Airborne) for actions in combat during his deployment to Afganistan. (Airborne) for his valor in Afghanistan. 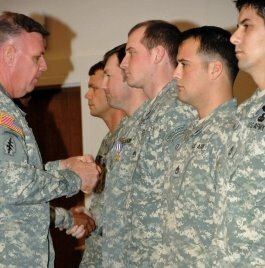 FORT BRAGG, N.C. (USASOC News Service, Dec. 12, 2008) – In one of the largest awards ceremonies since the Vietnam era, the 3rd Special Forces Group (Airborne) awarded 19 Silver Star Medals, two Bronze Star Medals for Valor, two Army Commendation Medals for Valor and four Purple Hearts here at the U.S. Army John F. Kennedy Special Warfare Center and School, Dec. 12. Addressing the standing-room-only crowd, Benton said that earlier this week the group had the honor of awarding 43 Bronze Stars for Valor and 39 Army Commendation Medals for Valor…. There are no roads leading into the Shok Valley. The village, which stands sentinel over the valley, is home to one of the fiercest of the insurgent forces in Afghanistan – the Hezeb Islami al Gulbadin, or HIG. 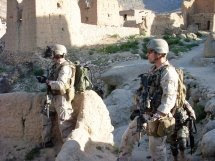 On April 6, 2008 a daring raid into the stronghold by Afghan Commandos and their Special Forces counterparts tested the mettle of the Afghan forces and further forged the bond between them and their SF brothers…. When you ask them to use one word to describe April 6, their words pop, much like the gunfire that rained down on them. More words followed as the team went back in their minds to that day. The team was assigned to take out high-value targets within the HIG. The insurgent group was entrenched in the valley and was guarded by a number of highly-trained foreign fighters. The sheer number of weapons and amount of ammo used by the insurgents led the team to conclude that they had been stockpiling the weaponry within the fortress-like village since the Russian invasion of the country during the late ’80s. You know there is more. Go read the whole story here. Or they would probably say “Just doing my job”! How blessed we are that such men do their “job” so well. My grateful appreciation to ALL of them.